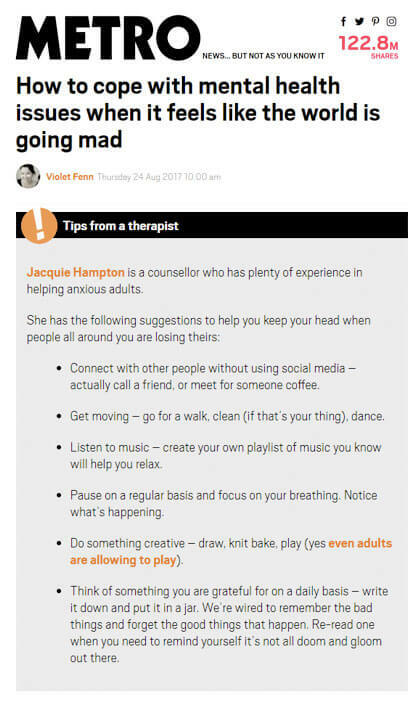 I was recently asked to provide some tips for coping with anxiety by journalist Violet Fenn for an article she was writing for Metro. Violet suffers from chronic anxiety disorder and in the article she reflects on her reaction to current events and the effect they’ve had on her mental health. Violet also talks about the things that have really helped her stay positive when things get tough. Here are my tips for handling anxiety when life is threatening to overwhelm you.